This concoction came about for my brother-in-law’s surprise 30th birthday tailgate. Given his preference for things spicy and stouty I came up with this recipe that allows for a stout taste and a little bit of that spice all while clearly being a chocolate cupcake. Having others try the cupcakes, without the icing they may be too spicy for some people so I would recommend trying it out and slowly adding the chipotle to the mix. We doubled this recipe and it came out to around 60 cupcakes (but we made them on the smaller side). Enjoy! Preheat 350 degrees Fahrenheit. Line cupcake pan with cupcake cups. Bring stout and butter to simmer in sauce pan. Add cocoa and whisk until smooth. Combine flour, sugar, baking soda, salt, and chili. Melt chocolate in microwave or a double boiler. Beat together eggs, chocolate, and sour cream. Add stout mixture and beat to combine. Slowly add flour mixture. Bake approximately 20 minutes until toothpick comes out clean. In a medium bowl, mix together the cream cheese and butter until creamy. Mix in the vanilla, then gradually stir in the confectioners’ sugar. The amount of sugar will give you the consistency you want. Store in the refrigerator after use. 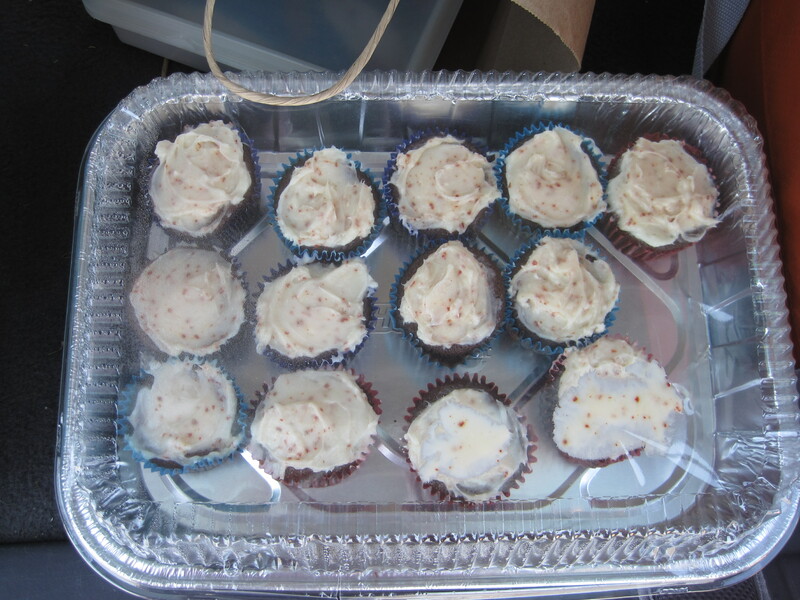 Due to absurd circumstances, we made these cupcakes in the middle of a road trip in my friends’ apartment in Columbia, MD, which is somewhere between 130 and 240 miles from either our destination or our departure point. It’s an apartment shared by two male friends of mine from high school, and is basically the worst possible place to decide to bake 60 cupcakes you can think of. Here are things I have a better shot of finding in their apartment than, for example, a medium-to-large mixing bowl. A framed picture of Donovan McNabb. A framed illustration (a drawing or something, definitely not a photograph) of the main cast of Seinfeld. A framed dime. Like US currency, legal tender, one-tenth of a dollar, dime. You might think it’s a collector’s item because of the frame, but it’s not. Approximate value of the dime? Ten cents. A hand-embroidered WWF desk chair. My point here is that it was difficult to work in their tiny ill-equipped kitchen with the fluorescent light that was capable only of flickering, as if it were telling us “It’s just not worth it to light the kitchen in this place”. The cupcakes, once made, were pretty awesome. We had combined and taste-tested a number of recipes, varying the amount of chocolate, beer, and chipotle until we hit the right one. 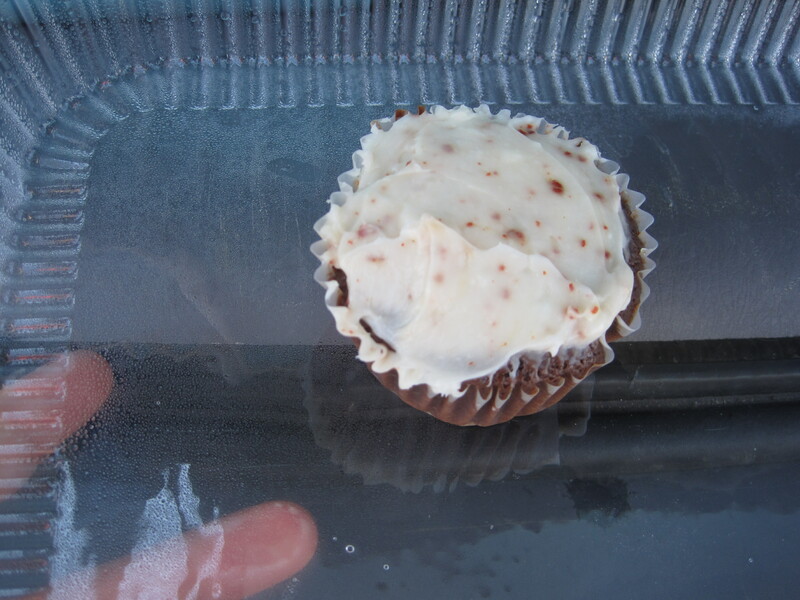 What I liked best about the cupcakes is that you tasted it in stages. The first thing I noticed when biting into one was the stout and butter flavor, which is a pretty good first thing to notice, cupcake or not. That taste sort of mellowed and the chocolate came out next. Just as I was thinking that I could taste the smokiness of the chipotle, but not the heat, a slow burn started, quenched after a few seconds by the rich cream cheese frosting. I was extremely impressed by the balance in these cupcakes. They combined a lot of strong flavors, and each seemed to shine through at different times. Definitely something I could see us making again. They have to be for the right crowd, and would go best at an activity where beer is featured, making them a great addition to a tailgate.